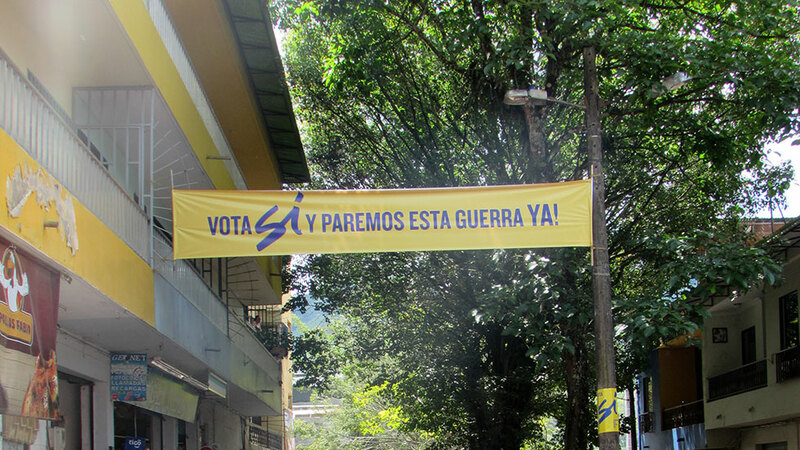 Over the past few days, I have been faced with the difficult task of explaining to friends and family outside Colombia the seemingly inexplicable: how could Colombians vote “no” to peace? Indeed, the negative outcome of Sunday’s plebiscite, which called upon Colombians to express their view on the peace agreement between the government and the country’s biggest guerrilla, left the international community in shock. As a somehow inverted response, President Juan Manuel Santos was awarded the Nobel Peace Prize on Friday. There is hope that this will facilitate the re-opening of peace negotiations and the achievement of national consensus. However, media attention to these (undoubtedly historical and welcome) developments diverts attention from what is the real worrying aspect of Sunday’s plebiscite result: the highest abstention rate since 22 years (63%), something no Nobel Peace Prize nor national pact will immediately fix. From the remoteness of conflict-affected Colombia, however, it is easier to understand where this result comes from. Following the plebiscite results, analysts have focused on explaining the reasons why people voted “no”, and politicians tried to seek different ways of going around this. But few are trying to understand the more interesting and less discussed issue of why people decided not to vote at all. The question then becomes not why Colombians voted “no” to peace, but rather, why were they indifferent to it? 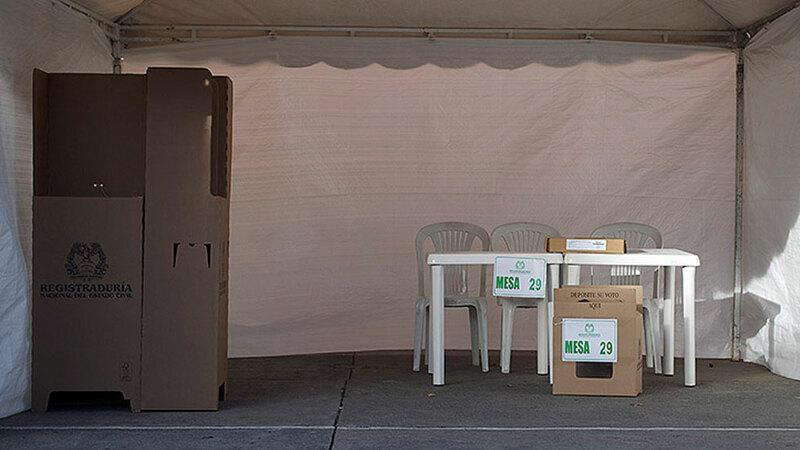 Many dismissively explain the high abstention rate as the product of widespread and long-standing political apathy: “Low turnout is the norm in Colombia”. But to really understand why people decided not to participate in a vote that had been repeatedly characterized as “historic”, we need to understand these people’s worldview. These seemingly superficial responses actually reveal two profound notions rooted in many Colombians’ way of viewing life – with, of course, some notable exceptions. The first is a deep skepticism towards social change and the eradication of violence. Many are convinced that peace negotiations were merely a political puppet show that would bring no concrete changes to their daily lives. The second is an instinctive reluctance to participate and take social change into their own hands. This is arguably a learned survival strategy in a country where civil society leaders and human rights defenders have been one of the most targeted social groups by all armed actors. These ‘shared social truths’ constitute the wisdom of generations that experienced war and were forced to learn how to survive. But these are also the words of wisdom that are passed on to the newer generations, who will be adults in the different peaceful society the political elites are supposedly working to achieve. In San Carlos, I have spent long evenings with groups of adolescents whose favorite night pastime is smoking weed while telling each other gruesome war stories they heard from their parents and grandparents, or the stories of the ‘new war’ that is taking place between urban youth gangs in cities. While they get excited about the most macabre details, they often confuse diametrically different actors: “Paramilitaries is just another way of saying guerrilla,” a 15-year-old once assured me. Hence violence, in its different facets, becomes part of their frame of reference and social imaginary. But this appropriation is often devoid of any political conscience about the structural, economic, social and ideological causes of the conflict. Rather than a political issue, violence is a way of life, which is re-enacted every day inside their homes (husband to wife, mother to children and so on). 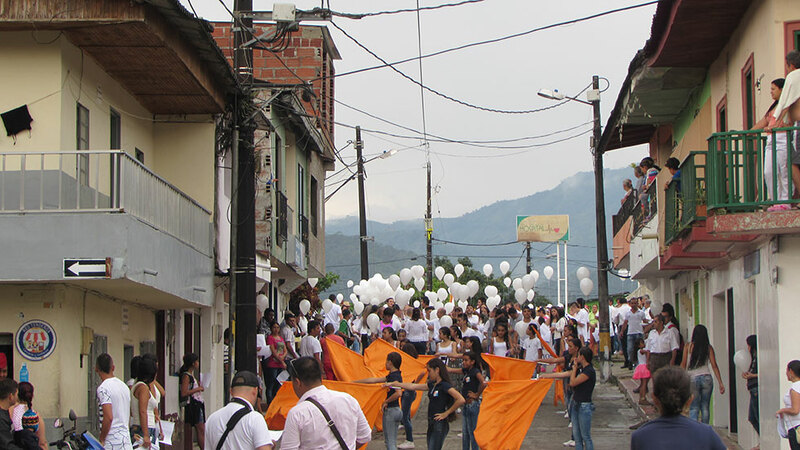 In San Carlos, the local government often promotes peace marches. But participants are few; most people simply watch from the balconies. Physical and psychological violence within the family, a widespread socially-accepted practice in Colombia, is the primary origin of a way of thinking whereby violence is a legitimate and effective way of imposing one’s will onto another’s. When I ask adolescents whether they would consider becoming politicians in order to improve society around them, they always answer with a clear “no” followed by laughter, as if my question was ridiculous. The almost-universally-shared belief is that “politicians are all corrupt,” and it is not surprising, given that it is presented as the truth by most high school teachers. And why should you try to change things all, anyways? “Keep to yourself and they’ll leave you alone.” This is another of the life lessons passed on by older generations to the newer. And mothers always tell me that good education is “from home to school, from school to church, from church to home.” The key message is: do not spend time outside, do not engage in the public space. That will only lead to problems. In the days prior to the plebiscite, large banners for the “yes” appeared in the village, but they did little to convince people. The dream of peace that the “Yes” campaign was asking people to believe in stood upon two basic premises: that peace can be achieved in the first place, and that it can be achieved through collective participation. In desperate search for optimism in the aftermath of the plebiscite result, some say that at least democracy won. But this is also a questionable victory. Perhaps if by democracy we mean abiding by people’s majoritarian vote, then yes, it won. But if democracy is a system in which citizens are not only given, but also profoundly care about, their right and duty to participate, this result is certainly evidence that true democracy is far from a reality in Colombia. If things continue this way, it is not likely to become a reality in the next generation either. Much more than a Nobel Peace Prize to an extremely unpopular president is needed to change many Colombians’ attitude towards public institutions. Elena Butti is a DPhil candidate at the Centre for Socio-Legal Studies of the University of Oxford. Her research investigates the experiences of conflict-affected children and youth in the transitional justice and peacebuilding process in Colombia. She is currently undertaking long-term fieldwork in the country, where she also collaborated with the International Center for Transitional Justice (ICTJ) and the United Nations Children’s Fund (Unicef). Her research interests revolve around international crimes, transitional justice, peacebuilding, victims’ and children’s rights, methods and ethics in research with children and in high-risk settings.